Gorilla trekking permit $600.00 per person is not included. Price per person rate is based on a minimum of 4 persons traveling. Our Uganda Explore with Gorilla Trekking safari allows you to immerse yourself in Uganda’s untamed playground, home to the world’s most spectacular animals and experience the thrill of gorilla trekking. The most affordable of its kind, this best-selling itinerary includes intimate encounters at three national parks filled with quintessential African wildlife, two incredible forests that are home to the great apes and authentic cultural experiences. This ‘once in a lifetime’ trip is neatly woven together by the charm and charisma that exudes from the Ugandan people you will meet along the way on Uganda Explore with Gorilla Trekking safari. 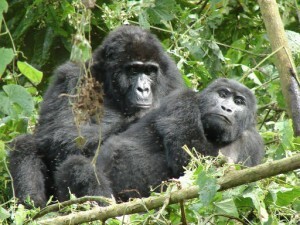 Your Uganda Explore with Gorilla Trekking safari begins with your overnight journey to Uganda. Enjoy an early breakfast before embarking on your journey to Murchison Falls with a stop along the way at the Rhino Sanctuary at Ziwa. You will be led by trained rangers will guide you through a memorable Rhino Trekking expedition. You will have the opportunity to observe the rhinos at a very close but safe distance. While at the sanctuary, you will also encounter a range of other wildlife species including Uganda kobs, reedbucks, oribis, hippos and Nile crocodiles; a memorable introduction to Ugandan wildlife. 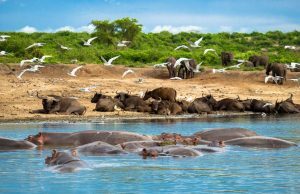 In the afternoon, you will arrive in Murchison Falls National Park, which is split into its northern and southern sectors by the mighty Nile that runs east to west through the Park. You will then check into the Paraa Safari Lodge and enjoy a welcome dinner. Afterwards, rest well as amazing game viewing awaits you tomorrow as you continue your Uganda Explore with Gorilla Trekking safari. This amazing day begins with an early wake-up call before sunrise for your first game drive, which in Murchison Falls is sure to be incredible. The park is home to elephant, buffalo, lion and leopard along with hippos, giraffe, as well as several antelope and monkey species. Most of the game viewing is done around the Buligi Game tracks in the northern sector of the park. The park also boasts the Nile – Lake Albert Delta, which is home to a large number of native birds, including African fish eagles and the rare shoebill storks. After lunch, it is time for a boat ride along the Nile to the foot of Murchison Falls, so be sure to have your cameras ready for this one! Expect to see birds perched on tree branches ready to hunt; mammals drinking or cooling down in the river; and reptiles basking in the sun on the river banks. 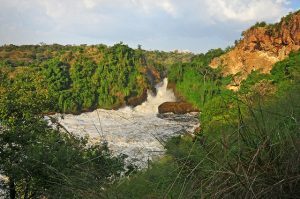 One of the highlights of the boat ride is getting up close to Murchison Falls itself, allowing you to feel the awesome power and beauty that comes when the world’s longest river is forced through a 7-meter gap before dropping 40 meters as is continues its journey to the Mediterranean Sea. This unforgettable trip on the River Nile harks back to the days of the intrepid explorers of days gone by. After an early morning game drive and breakfast, you will head south for a visit to the top of Murchison Falls for a scenic view from this vantage point, which really put the falls into perspective. Next, we travel to Hoima Town, which serves as stopping point midway between Murchison Falls National Park and Kibale Forest National Park. Historically known as the principal city of the Bunyoro Kingdom, Hoima Town represents a traditional blend of rural and town life you will not see anywhere else in Uganda. After a brief stop in Hoima you will continue the Uganda Explore with Gorilla Trekking safari, heading south towards Kibale Forest National Park, the primate capital of the world. Your once in a lifetime chimpanzee trekking experience has finally arrived! After breakfast, you will travel to the Uganda Wildlife Authority Headquarters at Kayanchu Gate where your trekking group will head into the forest with a guide after a short briefing. Approximately one hour before your group sets off an advance party of guides will have entered the forest to locate where the chimpanzees spent the night. Once located the advance party will send a radio message back to your trekking group so you can navigate through the forest to find the chimpanzees. During the trek, you will also get to see the different birds, animals and plant species within the forest. Once you locate the chimpanzees you will spend only one hour with them, which ensures that the chimpanzees don’t become accustomed to human contact. Next, it is on to the Bigodi Wetland Sanctuary, a part of the Magombe Swamp just south of Kibale National Park. 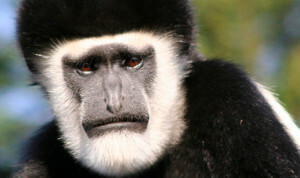 The Bigodi Wetland Sanctuary is an fascinating area recognized for a extensive array of biodiversity, among which are several primates species like the red colobus monkey, baboon, black and white colobus monkey, blue monkey grey cheeked, mangabey, vervet monkey, red tailed monkey and the L’Hoest monkey. Additional mammals such as chimpanzees, mongooses, bush pigs, otters plus bush bucks, also visit this swamp coming from the adjacent Kibale National Park. A visit to this sanctuary enables you to see rare mammals and birds, like the webbed feet sitatunga and the great blue turaco, which call this diverse place home and over two hundred species of birds that inhabit the swamp. The excitement of chimpanzee trekking will likely still be with you as the safari continues to Queen Elizabeth National Park in the afternoon. 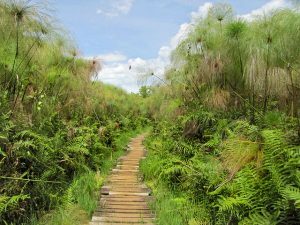 Entry will be via the northern sector famous for the Kasenyi Plains and Kazinga Channel, where you will notice a distinct change in scenery as the lush green crater lake region of surrounding Kibale Forest gives way to the open savannah lands of Queen Elizabeth National Park. 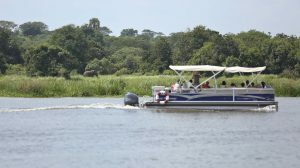 One of the highlights of visiting Queen Elizabeth National Park is the afternoon boat ride along the Kazinga Channel. The boat ride is a round trip beginning at the Mweya Peninsula and lasting approximately three hours. The Channel is a 32-kilometre long natural channel that links Lake Edward and Lake George. The channel has one of the world’s largest concentration of hippos, numerous Nile crocodiles, buffalo, elephants and a whole host of birds, including African fish eagles, kingfishers, herons, storks and skimmers. The early evening schedule includes a bit of local culture with a visit to the Kataara Women’s Group to learn about the the artistic diversity of the local products that they are creating and selling to support the village. A visit to the group will enable to find out more about how this incredible enterprise works and be inspired by the individual stories that the women have. There will also be a chance to support the group by purchasing reasonably priced crafts. With the Kazinga Channel and the game drives in the northern part of the park experiences ticked off your list, Queen Elizabeth National Park has a parting gift for you as you head south. The Southern Sector of Queen Elizabeth National Park is called the Ishasha Sector. Ishasha Sector is famous for the fig tree climbing lions that inhabit this area. It is somewhat uncommon for lions to actually climb trees. 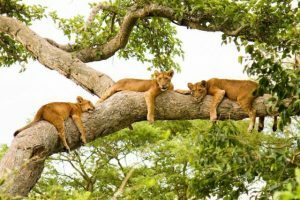 There are no more than 2 populations in whole world of such lions that do actually climb trees as part of their day to day behavior; one of these populations is found within the Ishasha sector of Queen Elizabeth National Park. The lions are normally seen lazily lying up within the branches of the huge fig trees staring down at the numerous Uganda kobs that are graze in the open Ishasha plains… and are actually the main prey of these lions. Driving this way will give you an opportunity to catch a glimpse of these lions, which make a great photo. After the game drive, depart the Ishasha Sector of Queen Elizabeth National Park, you will continue to head towards Bwindi. This will give you an opportunity to catch a glimpse of the lions and take another great photo or two. You will enter Bwindi via the northern sector of the park and begin to see the mountainous hills and valleys that the gorillas call their home. We hope your camera is charged and you are ready for what lies ahead because your bucket list Gorilla Trekking experience has arrived! An early start will see you transfer to the Park Headquarters for a briefing with the Uganda Wildlife Authority guides. An advance party of guides will have gone ahead into the forest to locate where the gorillas slept the previous night and will have begun tracking their movements. These guides will communicate with your team via a walkie-talkie and the trek into the forest will begin. Locating the gorillas can take a few hours or the whole day depending on how far they have moved from the place they spent the previous night. Once they are found, for conservation purposes, the amount of time allowed with the gorillas is one hour. As you trek through the forest you will appreciate why the forest is often called impenetrable. There is also a multitude of other animals that you might encounter including antelopes and rare monkeys not to mention the beauty of the forest itself. Once you have completed the trek you will return to the lodge, for a well-earned rest and time to reflect on a truly magical experience. Uganda With your Gorilla Trekking experience still a vivid memory, it is time to begin your journey home. After an early breakfast, you will be transferred to Kihihi for your flight back to Entebbe, which is included in your package. On your flight back from Bwindi to Entebbe, you will be afforded a fantastic view of Bwindi, The Impenetrable Forest, from the air. Make sure you have your camera ready or simply enjoy the amazing view. From this high up you can also see the mountains and forests in Congo and Rwanda! On arrival in Entebbe, you will be able to continue your journey home! Arrive home with treasured memories of your Uganda Explore with Gorilla Trekking safari.